The Bobby Gunn Student Leadership Award was created to recognize one of the true pioneers in athletic training and the instrumental role he has played in the profession. It provides a deserving student from each district assistance to attend NATA’s annual convention. Robert “Bobby” Gunn was a true unsung hero of athletic training. He was a founding officer of the Southwest Athletic Trainers’ Association (SWATA) in 1955 and served as SWATA vice president from 1955-56 and SWATA president for two consecutive terms in 1956 and 1957. During this time, Gunn typed the original SWATA constitution. He became the District Six director in 1963. From 1965-69, he served on the NATA Board of Directors, the last two years as chair. Gunn was the first person elected and re-elected, serving as NATA president from 1970-74. Along with his commitment regionally and nationally, Gunn also served as a representative to the Joint Commission on Competitive Safeguards and Medical Aspects of Sports, American College Health Association and AMA Conference on Medical Aspects of Sports. 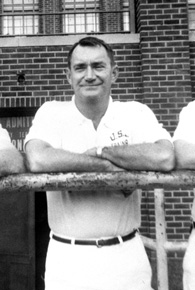 In addition to his service to the profession, he also served as athletic trainer for the third Pan Am Games (1959), Lamar University (1962), USA Soccer Team (1964), Pan Am Games (1967), NFL Washington Redskins, Houston Oilers (1962-1974), Shreveport Steamer of World Football League (1974) and five Texas High School Coaches Association All Star Games. He completed his career as a clinical outreach athletic trainer with Baylor Hospital system. After years of commitment, service and contribution, Gunn was honored as a SWATA Hall of Fame charter member and NATA Hall of Fame member. You can read more about Gunn's legacy in the April 2007 edition of the NATA News. Undergraduate or entry-level master's students who are members of NATA. The district provides a travel stipend for the NATA convention. NATA will waive the convention registration fee for each of the winners. The award recipients will be recognized at the annual meeting during the Pinky Newell Scholarship & Student Leadership Breakfast. Each district has its own application process and selection criteria. For details contact your district director.